After beating off the initial Japanese attacks, the commander of US forces on Wake Island never sent the message, “SEND US MORE JAPS.” In that era, US military regulations for enciphering radio and telegraph messages specified that strings of meaningless words were to be sent as padding before the actual message and after the actual message. When the message from Wake Island was deciphered by Pacific Fleet Command at Pearl Harbor, the string of words prefacing the actual message read: “SEND US STOP NOW IS THE TIME FOR ALL GOOD MEN TO COME TO THE AID OF THEIR PARTY CUNNINGHAM MORE JAPS….” Who inserted these four words in the original dispatch is a matter of dispute. Who in Pearl Harbor “leaked” the supposed message from Wake Island to the press is not known. What is known is that the message “SEND US MORE JAPS” is a hoax, although it remains one of the most well known phrases from the war. 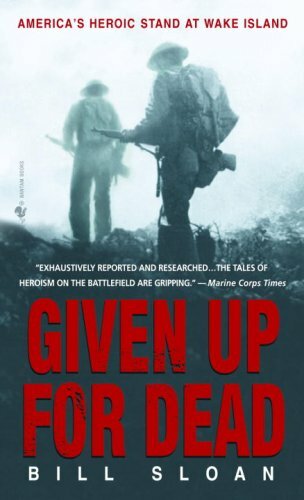 Source: Given Up For Dead: America’s Heroic Stand at Wake Island by Bill Sloan. I rate this book three stars which in my system of stars means “very good and worth reading” and it is. One of the most fascinating aspects of history for me, and I imagine for most of us who are amateur historians, is this: a lot of what we learn in history often turns out not to be true. In this case, lots of research by the author including several dozen interviews with survivors unmasked the hoax. The men, in fact, were horrified to hear this supposedly true message of “SEND US MORE JAPS” being broadcast by US civilian radio stations (which they could pick up on their military radios). Wrecked US Marine Corps Grumman F4F-3 Wildcat fighters of Marine Fighting Squadron 211 (VMF-211), photographed by by the Wake Island airstrip sometime after the Japanese captured the island on 23 December 1941. Civilian contractors are marched off to captivity after the Japanese captured Wake, 23 December 1941. Some, deemed important by the Japanese to finish construction projects, were retained there. Fearing a fifth column rising, the Japanese executed 98 contractors in October 1943 after US air attacks, an atrocity for which atoll commander, RAdm Shigematsu Sakaibara, was hanged after the Second World War. The story of the defense of Wake Island by the US Marine Corps and a crew of unarmed civilian construction workers is a classic tale of courage and dedication by many, dereliction by a few, and an inspiring leader, Major James Devereux, USMC, who displaced the nominal commander, a US Navy Commander. The Japanese attacked Wake Island on 8 December 1941, the day after the surprise attack on Pearl Harbor. Present on the island at the time of the attack were an understrength USMC battalion of 450 men, 68 men from the US Navy, and 1,221 civilian workers of the Morrison-Knudsen Company who were constructing a landing strip and other facilities for the US Navy. After the initial Japanese attack was resisted, a rescue flotilla was sent from Pearl Harbor but recalled with only one more day remaining till they reached Wake Island. This condemned the defenders. In the face of massive Japanese naval power and thousands of Japanese troops who landed on the island, the garrison finally surrendered on 23 December 1941. 433 US military men and 1,104 civilians were taken prisoner. 15 US military men and 82 civilians died as a result of their brutal treatment while prisoners of the Japanese which lasted until the end of the war. In addition, 98 civilian workers were executed on the island in 1943 when the Japanese feared an invasion by the US. People are constantly discovering documents thought to be lost which were misfiled. In this case, a great deal of research on the part of the author fell into this category.